If you have already installed Visual Studio 2015 then you need to just install Update 3. You can find Visual Studio 2015 Update 3 at here. Hard Disk: Minimum 4GB Available Hard Disk Space. Installation is very easy and you won't get any trouble. However, you will get some warnings or errors regarding Microsoft Visual C++ Redistributable file. Don’t get panic. All the redistributable files are freely available over the internet and it is light weight (Under 5MB). Find, download and Install them. After installing Visual Studio 2015 Community Edition with Update 3, your PC is ready to install .Net Core 1.0 Framework. You can download .Net Core 1.0 from Here. However, I couldn’t find offline installer of .Net Core 1.0 so it is web installer but you may find it. You need to internet connection while installing .net core. You may get some warnings while installing .Net Core 1.0 regarding Microsoft Visual C++ Redistributable File. If you are getting trouble due to this file then don’t get panic. Do the following steps. Find on google and download this file. Almost all the redistributable files are tiny in sizes (under 5 MB) so it can be quickly downloaded and installed. All the files are freely and easily available. 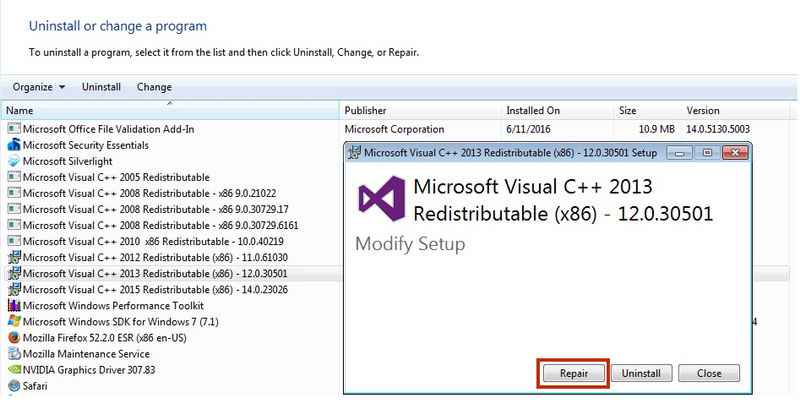 If you have already installed the C++ Redistributable file and still getting the same error then repair the installation. It will make a new entry to registry file and you will be able to work with Core technology. Find your redistributable file and right click on that. Click on Change. A setup window will open. Click on Repair and finish action. After finishing repairing all the vc++ redistuble file, Run the .Net core installation again. Congratulations!!! If you have finished all the process successfully then you are ready to make demo apps in Core 1.0. In the next chapter you will make your First ASP.Net Core 1.0 Project. If you are having any trouble in installation of Visual Studio 2015, Update 3 or .Net Core 1.0; leave your trouble in comments. We will surely help you.